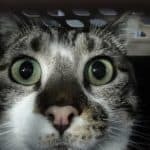 Did your cat pee in her carrier? Well, that’s unfortunate. The stain and smell of urine are going to give you a lot of pain unless you know the correct procedure to clean cat urine from carrier. 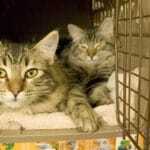 In this article, I am going to explain in details how to clean cat urine from carrier. First, we need to deal with the smell. The odor of cat urine is enough to make anyone go mad! It stinks so bad that there are products specially made for dealing with cat urines. To make the odor go away, you can use enzyme-based cleaners. Odor removal products can also be a great use to deal with the stinking smell. Here is my favorite enzyme-based cleaner to deal with cat urine. I found it the most effective and cheap. First, you need to soak up the urine from the carrier. A paper towel or any other similar thing will do that effectively. Then you need to pour heavily the enzyme-based cleaner on the affected area. Let the area soak the cleaner. Now let the carrier dry on its own. Air drying is the best option. You can make the affected area secured by covering it with a baking sheet or laundry basket (upside-down). First, find the affected area inside the carrier. Now pour some ammonia on it. Wait for some minutes and let the ammonia dry out. After that, cover the affected area with a coat of baking soda. Again wait for some time. After then vacuum the whole area. Be careful when dealing with ammonia as it can harm your hand. I’ll advice using a protective glove when dealing with it. If you have time and don’t need to use the carrier for a couple of months, then this solution will work wonder. Heavily pour hydrogen peroxide on the affected area, then out a deep coating of baking soda. Let this sit for at least a couple of months. It will give you permanent relief from the stinking smell of cat urine. Take a spray bottle and pour white vinegar inside it. Now spay the affected area heavily with the white vinegar. Let it dry out. I have also heard people using Listerine Mouthwash to get rid of the cat urine smell. Just use some drops of Listerine in your water-vinegar mixture or peroxide solution. If you want, you can also make a solution of Listerine with hot water and use that to clean the affected area. The high concentration of alcohol in Listerine is the reason it works effectively against cat urine smell. This is an extra step but I’ve found it to be amazingly effective to counteract the cat urine smell. After you have treated the carrier with the vinegar solution, place the carrier inside a plastic bag. Now take some cotton balls and pour a few drops of essential on them. The oil can be of any flavor you prefer e.g. vanilla, lavender, lemon, or cinnamon. Now place the cotton balls with the carrier inside the paper bag. Seal the paper bag off. Leave it off for at least 24 hours. After that take out the carrier from the plastic bag and remove the cotton balls. The smell of the essential oil should counteract the odor of cat urine. I know that vinegar and ammonia have a distinct smell of their own, but they are the best natural weapons to deal with cat urine odor. If none of the technique mentioned above works for you, then it’s time to take the help of the pros. Take your cat to a carpet cleaning company that specializes in removing pet urine odor from carpets. They’ll have the necessary tools and chemicals to properly deal the consistent odor of your cat’s urine. If you not get rid of the odor completely, there is a high risk of your cat doing the same thing again. It is because, cats mark places with their smell. The place that odors strongly of their urine is the place they use for urine. That means, if your carrier still smells of cat urine, then the cat will think of the carrier as a place for urinating (aka a litter box). So, she will relief herself again inside the carrier. That’s why it is very important to completely get rid of the cat urine smell from the carrier. So, this is my guide on how to clean cat urine from carrier. For me, the enzyme-based cleaner worked best to get rid of the urine odor. I think it will do the same for you too. If it doesn’t, try out the other methods mentioned in this guide. Also, there are always professionals to help you out if nothing works. 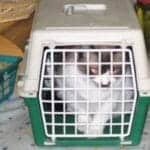 How To Disinfect A Cat Carrier?